To follow along, get an EDN license and an AWS account. Especially, if you have been in the industry for long, there’s no good excuse to not have those with the biggest companies in GIS and da Cloud (and while you are at it, get MapBox and CartoDB accounts too). # Downloaded its AWS key from //aws.amazon.com/console/ and connected to my instance (ensured it matched the min. system requirements) using its public DNS (if you restart your instance, this will change). Note I SSHed using Cygwin instead of PuTTy. # I used a M4.LARGE instance with a 20GB EBS volume (in the same Availability Zone, of course) - ensured it didn't go away if I were to terminate the instance. Then, I extended the partition to exceed the min. space requirements (took a snapshot first) - unfortunately, AWS docs didn't help much with that. $ lsblk # Listed block partitions attached to the device. Since there was a gap in sizes between the partition and the device (and there were no other partitions), I resized the child partition "XVDA2" (the root file system where I would finally install ArcGIS Server) to use up the surplus space on its parent disk "XVDA". $ sudo xfs_growfs / # This is the actual change for XFS. If 'df -T' reveals the older EXT4, use 'resize2fs'. # Got the right ECP#########? # Created and uploaded authorization.txt, and downloaded authorization.ecp from //my.esri.com/ -> "My Organization" -> "Licensing" -> "Secure Site Operations"
Root Server Directory: /home/username/arcgis/server/usr/directories # To store output images, etc. Configuration Store: /home/username/arcgis/server/usr/config-store # To hold info about the server's machines, services, directories, etc. > Cluster 'default' successfully created. > Failed to create the site. com.esri.arcgis.discovery.servicelib.AGSException: java.lang.Exception: AutomationException: 0x80040154 - Could not create object 'ConfigurationFactory'. > Disconnecting the site from the configuration store. sudo yum install Xvfb # Else "Unable to start Xvfb on any port in the range 6600-6619"
After years of doing this with first ESRI (PROD), then MapServer (PROD) and GeoServer (DEV), I went back to the dark ahem ESRI side. And what do I keep finding? That the big two are blending together in terms of looks. E.g. The console of the other Java-powered mapping server, GeoServer, is looking similar to that of its big brother on-steroids. The third, MapServer, somewhat paradoxically on the other hand, has both come a long way (MapCache and ScribeUI, yay!) and still lost ground. * I tried both 10.3.1 and 10.0 on Ubuntu (15.04), unsupported. While both installed, site creation didn’t work because of missing packages – searching through apt-cache didn’t help either. On Windows, there is always their CloudBuilder. Clearly, there’s no shortage of health data or technologies, esp. following ACA’s requirements of uniform data collection standards, just a continuing kerfuffle with overlaying disparate JSON/OGC tiles from their many data owners and manifold service endpoints. Unfortunately, only part of this problem is technical. Take Flu mapping, for instance. CDC, WHO, WebMD (with MapBox) and Google, even Walgreens does it. 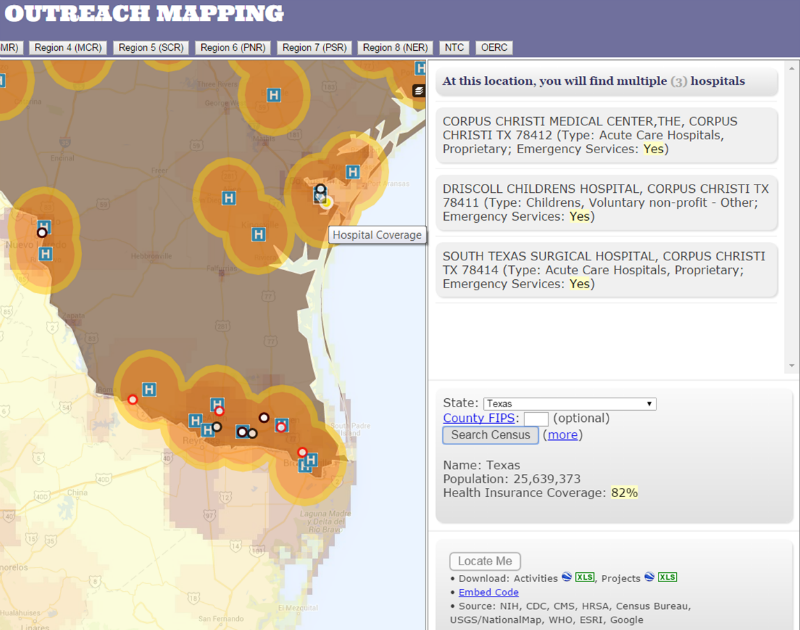 Or take HIV mapping where you can choose from CDC and NMQF, among others. Even anonymized private claims data is available for a couple of Ks a month. I think a bigger part of the problem is the misalignment between vendors’ business interests and mandates of various agencies and goals of the health research community at large. At some point, researchers and epidemiologists would want to see how these data tiles correlate to each other. And GIS professionals would want a quicker way to ‘overlay this layer’ with out having to dig through Firebug. And compress it over the wire, while you are at it (when our users in remote Africa were asked to switch off their smartphones to view desktop maps, we understood data compression a little differently). And then they would want to analyze them, be it on the server with Big Data or in the client with smaller ones. On analyses, your favorite GIS continues to take heat from tools like Tableau among conference attendees. Overall, a growing use of ArcGIS Server’s publisher functionalities and a compelling body of story map templates leveraging its narrative text capabilities. E.g. Atlas for Geographic Variation within Medicare. On publishing, I suspect some researchers would like to see a Mapbox plugin for QGIS. Yes, you can render and uploads maps from TileMill to your Mapbox account, but CartoDB has QgisCartoDB where you can view, create, edit or delete data from QGIS to your CartoDB account (I needn’t add that Python-powered QGIS remains a favorite among matplotlib-loving researchers). ++ While log analyses attest that mono-themed web maps provide a better user experience, given the nature of health data and the costs behind spinning off another mapp (yup, blended words to make a portmanteau), sometimes you just have to combine themes.